Long unheard, Coolpad is rumored to be launching a new smartphone. Not in Indonesia, this Chinese brand will launch Coolpad Cool 3 in India on February 5, 2019. This smartphone comes with a notch dewdrop screen and is packed with a glossy rear panel. Will be sold at a price below 6000 rupees, Coolpad Cool 3 will be available in three color variants. While based on this smartphone information will come carrying Android 9 Pie as the operating system. For displays, it is possible that the smartphone is packed with a 6.3-inch IPS LCD screen with Full HD + resolution and will be coated with a 2.5D curved glass protector. Looking at the teaser image, the smartphone appears to have a sleek body and sleek design. Coolpad Cool 3 is likely to have a dual-camera rear feature that is arranged vertically with an LED flash between two camera sensors. As for the front camera, in addition to selfie, other functions of the aiming device also support the Face Unlock feature. Currently there is no information about the processor chip used by Coolpad Cool 3. Meanwhile, according to predictions the smartphone will come with 3GB / 4GB RAM variants and 32GB / 64GB of internal memory. 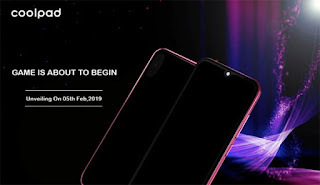 With a selling price of around 6000 rupees (Rp1.1 million), this smartphone is predicted to compete with Redmi 6 and Realme C1. 0 Response to "Coolpad Cool 3, Using Notch Waterdrop Screen and Android Pie"